Hemp Clothing Benefits – A Sustainable Choice! 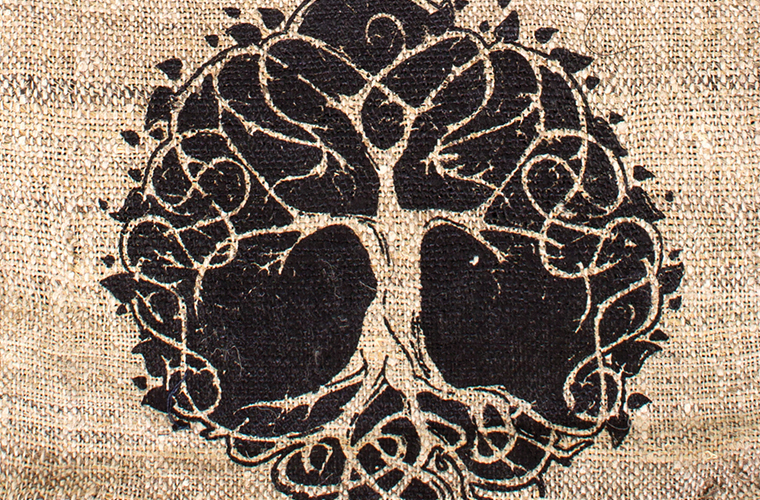 Soul Flower is an earth loving clothing company that focuses on eco-friendly fibers and sustainability. 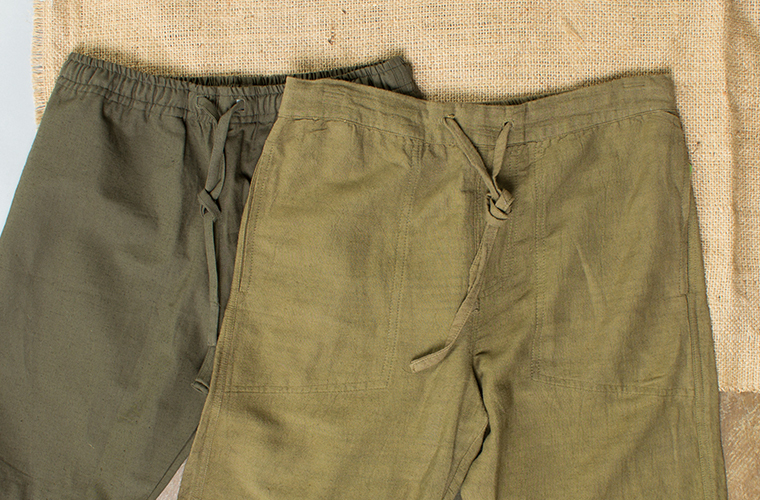 We use a lot of eco-friendly fabrics, be we especially love using hemp fabric for our clothing. 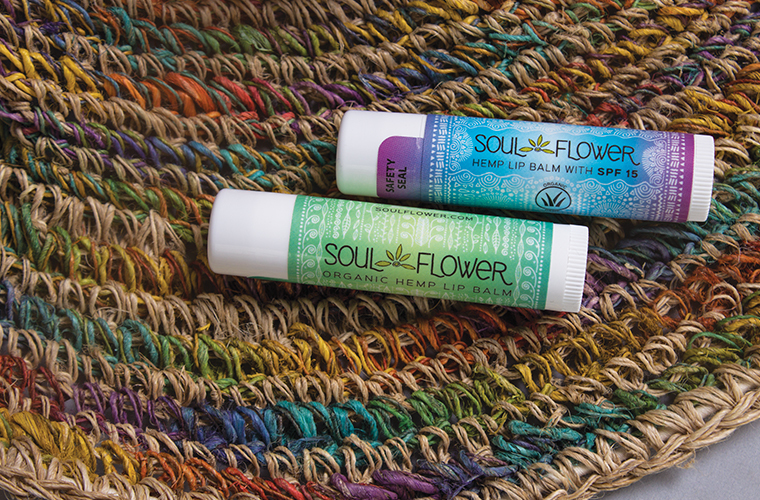 What is it we love about hemp fabric? The benefits of using hemp fabric in clothing are ahhhh-mazing… We love hemp because it’s a sustainable fiber that revives soil and requires no herbicides, pesticides, or fungicides to grow. We love hemp because it is efficient, durable, and long lasting. We love hemp because it is soft and comfortable. We love it so much, we created this list of six hemp clothing benefits to tell you about unbelievable qualities of the hemp plant and how well it works in fabrics! 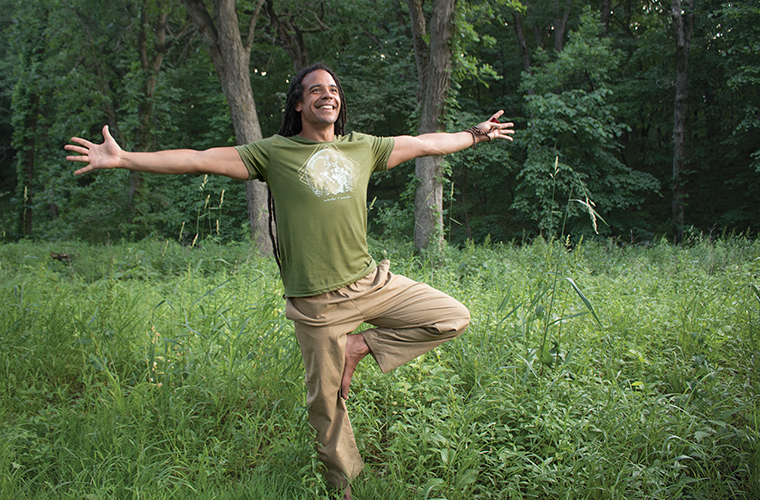 Read on to find out the benefits of hemp clothing and all the other amazing qualities of hemp. First of all, what is hemp? Hemp is a variety of Cannabis sativa grown industrially for use in textiles, construction materials, oils, foods, and more. Hemp grows tall, with sturdy fibrous stalks and has very low, non-intoxicating levels of THC. The hemp plant is rather amazing and can be used in its entirety for all kinds of items, including hemp fabric! Hemp is a hearty crop that can grow nearly anywhere in the world, from the Arctic to the equator. It requires just half the acreage of cotton, and produces up to 3 times more fiber than cotton on the same amount of land. An amazing benefit of hemp production is how easy it is on our Mother Earth! Hemp grows rapidly—faster than weeds!— and unlike conventional cotton requires no pesticides or herbicides. Think about it, if we could grow a crop without having to cover it in pesticides and other chemicals that hurt the environment, we would have so much less contamination of our water and earth! Hemp is that crop. Compared to cotton, hemp needs only a fraction of the amount of water to grow and process, using little to no irrigation. In some places, the water required by hemp crops is supplied entirely by rainfall. The hemp plant helps purify the soil and its deep root systems help preserve topsoil from erosion. Hemp crops don’t need to be rotated, and can be grown on the same soil for many years in a row without depleting it. Wearing hemp clothing benefits the environment but also benefits you! Hemp fibers are 10 times stronger than cotton and one of the strongest plant fibers out there. Hemp fabric holds up and wears well! Plus hemp fabric absorbs dye easily and resists fading. 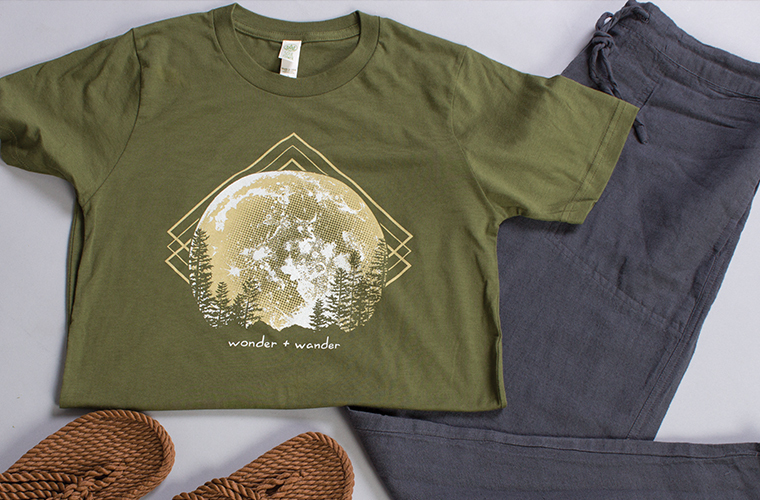 Hemp clothing resists abrasion and holds its shape, yet gets softer with every wash. (For example, our amazing Soul Flower hemp pants are strong but get softer and softer every time you wash them!) It’s also naturally resistant to mold, mildew, and even UV rays! 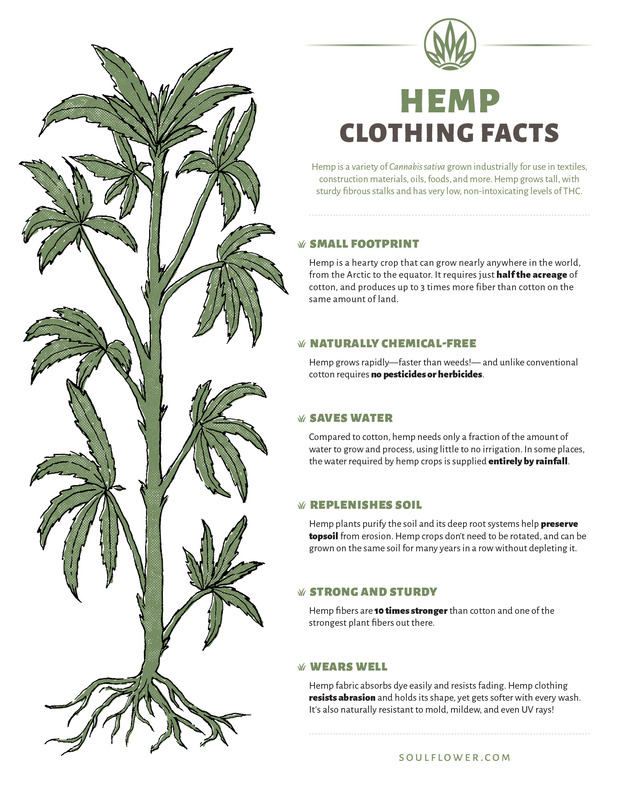 Benefits of Hemp Clothing – Just the Facts!